Our guests this morning are authors Usaid Siddiqui and Owais Zaheer who put together a detailed report on the historic bias of the mainstream American news media against Arabs and Palestinians … We continue a discussion about a new report issued by 416 Labs which has analyzed 50 years of news media coverage of the Palestine, Israel conflict and the Arab World. The study confirms what many people already new, that the American mainstream news media is biased and intentionally skewers information to demonize the Arabs and Palestinians while portraying Israel as the victim. The media also minimizes Israel’s actions to whitewash criticism. The report is titled: “50 Years of Occupation: A Sentiment and N-Gram Analysis of U.S. Mainstream Media Coverage of the Israeli Occupation of Palestine.” You can visit their website to review the report by clicking here. 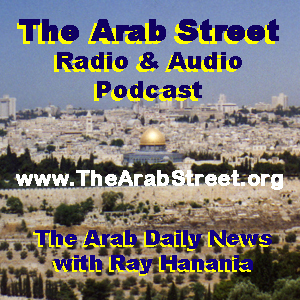 THE ARAB STREET Radio & Podcast is a part of the US Arab Radio Network hosted by Laila Alhusini … in an effort to energize and empower Arab Americans to stand up for their rights … for more information go to my website at www.Hanania.com. Our show is available afterward on podcast on iTunes or by visiting the website www.TheArabStreet.org. The live radio show broadcasts at 8 AM Detroit (EST) Time until (9 AM) (7 AM Chicago Time CST, or 3 PM Occupied Jerusalem Time). You can call 248-557-3300 during the radio show to participate in the discussion. The radio show is podcast and you can listen to past radio show and podcast audio interviews by visiting the website www.TheArabStreet.org or by looking up “Ray Hanania” or “The Arab Daily News” on iTunes, or click here to view the iTunes podcast archive of The Arab Street Radio Podcast.